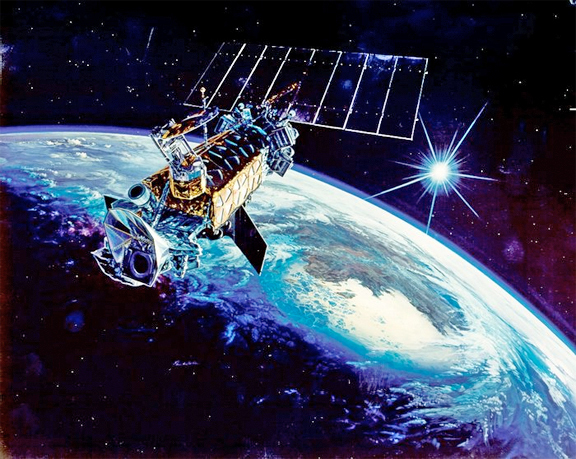 A U.S. Air Force Defense Meteorological Satellite Program (DMSP) satellite, a military weather satellite located in low-Earth orbit. [SatNews] After studying the recent explosive break-up of a U.S. satellite, ESA space debris experts have concluded this event does not increase the collision risk to nearby ESA missions in any meaningful way. The U.S. Air Force’s Defense Meteorological Satellite Program Flight 13 (DMSP-13) broke up into some 40 pieces on February 3rd. The military weather satellite was in a LEO at more than 800 km altitude. 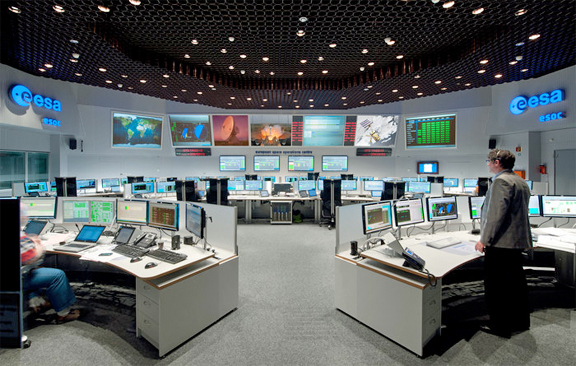 ESOC serves as the Operations Control Centre for ESA missions, and hosts our Main Control Room (shown here), combined Dedicated Control Rooms for specific missions and the ESTRACK Control Centre - which manages our worldwide ground tracking stations. ESOC also hosts facilities for satellite communications, navigation, networks and other special functions. Photo is courtesy of ESA—j. Mai. Based at ESA’s ESOC space operations center in Darmstadt, Germany, the Space Debris Office receives space debris data from the U.S. Joint Space Operations Center and performs analyses and simulations of the present and future debris environment, as well as working with missions to prepare ‘collision avoidance maneuvers’. Satellite fragmentations are typically triggered by break-ups of tanks or batteries caused by remnant onboard energy sources under the influence of the harsh environment in space. 70 percent of all cataloged objects are in low-Earth orbit (LEO), which extends to 2000 km above the Earth's surface. To observe the Earth, spacecraft must orbit at such a low altitude. The spatial density of objects increases at high latitudes. Note: The debris field shown in the image is an artist's impression based on actual data. However, the debris objects are shown at an exaggerated size to make them visible at the scale shown. The dispersion of the fragments associated with the DMSP-13 event is fairly large—however, the largest concentration of fragments resides near the altitude in which the satellite operated. This is still about 100 km above ESA’s satellite constellation. The fragments will slowly decay over the years and decades to come. ESA’s Clean Space initiative—tasked with reducing the environmental impacts of the space industry on both Earth and space—is looking into the technology to mitigate the debris levels in heavily-trafficked LEOs. At orbital velocities, even a 1 cm nut could hit a satellite with the force of a hand grenade. On March 18 to 17, technical experts will meet at ESA’s ESTEC technical center at Noordwijk, the Netherlands, to discuss debris mitigation technologies: methods to ensure that satellites can remove themselves from key LEOs well in advance of such a fragmentation event occurring, while also reducing the risk posed by reentering satellites. Simulations of orbital debris show that actively removing large items of debris, such as entire derelict satellites, should help stabilise its population and prevent a collision-based cascade effect. 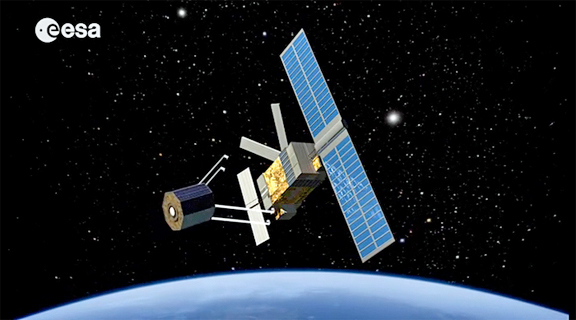 ESA has performed a system study for an Active Debris Removal mission called e.Deorbit. However, mitigation can only go so far. 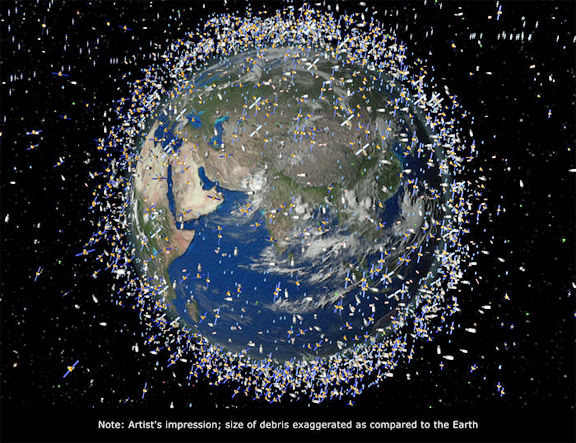 Projections show that the debris population will continue to grow through a chain reaction of collisions unless individual large items of debris—derelict satellites or launcher upper stages—are periodically retrieved. ESA’s e.DeOrbit mission, currently undergoing preliminary Phase A/B design for launch in 2021, aims to demonstrate the feasibility of active debris removal.